Kyle Blue - Bristol Harbour Luxury Hostel Boat i Bristol, England: Reservér nu! The Kyle Blue is moored in the heart of Bristol's historic harbour. Set in a peaceful location yet only a five minute leisurely stroll along the quayside to the city centre. The Kyle Blue Bristol offers private and shared cabin accommodation. 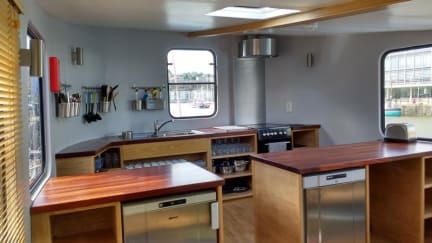 The spacious upper deck provides fabulous views of the harbour waters from its tranquil lounge and well equipped self-catering kitchen. The boat is moored on Wapping Wharf in the heart of Bristol Harbour between the award winning attractions of the SS Great Britain and the MShed Museum. 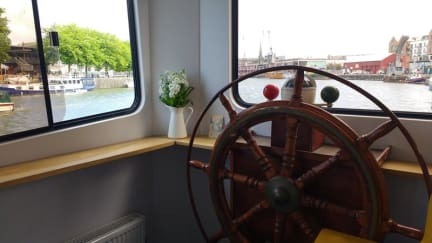 The Kyle Blue is in a great location to explore the harbourside and old city areas, and visit the magnificent Avon Gorge, Brunel's suspension bridge or enjoy Bristol's cultural base of theatres, museums and art galleries. The 30 bed Dutch Barge has undergone complete renovation by the current owners. The hull of the boat now offers 30 beds in private and shared cabin accommodation. Whether you are an independent traveller, travelling alone or in a small group of friends or family, the Kyle Blue offers sleeping accommodation to cater for a variety of needs. Check out from 00:00 to 10:00.